The action began on the evening of Feb. 11 near the village of Nyzhniye Vorota. Ukrainian Prime Minister Arseniy Yatsenyuk has demanded that Russia lift the ban on the transit of Ukrainian trucks. "We are acting in full compliance with international legislation. Yesterday, the Russian Federation announced a ban on the travels of Ukrainian trucks in its territory," he said at a Feb. 15 meeting with Turkish Prime Minister Ahmet Davutoglu. Yatsenyuk said Ukraine had sent a note to Russia demanding an explanation. "Before receiving explanations all permits issued to the Russian Federation for transit transportation have been suspended. I insist not only on an explanation, but a full removal of restrictions on the transit of Ukrainian vehicles [in the territory of Russia]," he said. It was reported on Feb. 15 morning, that until Russia presents an explanation, Ukraine will suspend transit transportation by trucks registered in Russia in the territory of Ukraine, in response to the suspension of the travel of Ukrainian trucks in Russian territory. The press service of the Ukrainian government announced that the Ukrainian side was in consultation with EU countries. 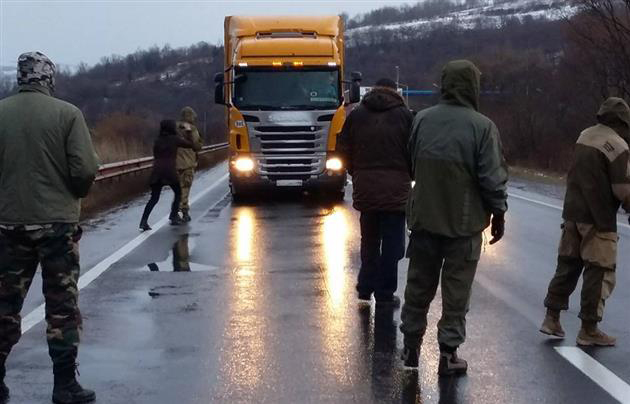 An action to block Russian trucks started on Feb. 11, in the Zakarpatye region. Then, activists in Volyn region joined them, and the number of regions where activists blocked trucks reached 10. The Ukrainian Infrastructure Ministry said that it did not have power to stop the actions. On Feb. 15, the Russian Transport Ministry announced that the movement of trucks registered in Ukraine was suspended in Russia. According to Rostransnadzor oversight authority, by Monday morning, 152 vehicles owned by Ukrainian carriers were stopped in Russian territory.